The evangelising of children continues to be the main aim of "Feed My Lambs". We thank God for opportunities given to teach them the Gospel and share with the boys and girls their need of salvation. These are special one day events which are held for local boys and girls and were first started by Joyce in the Nakuru area. Running for a few hours, they usually consist of Bible Teaching, Memory Verses, Singing, Games and Refreshments. In September 2010, 180 children attended one such rally in Nakuru. Later, just before Christmas, 345 children attended a rally in Western and on 26 February 2011 another successful rally in the Rift Valley province saw over 400 in attendance. We thank God for such opportunities to share the Gospel directly with boys and girls. These rallies also provide opportunities for adults who have attended our teacher training seminars to put what they have learnt into practice. We pray, that through these rallies, souls will be saved and the born again child as well as the teacher will be encouraged in their walk with God. July 2008 - We are very excited to announce that we have just printed our own tracts/Gospel leaflets. Our prayer is that these will be distributed among boys and girls in Kenya. 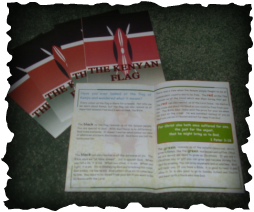 The leaflets are based on the flag of Kenya and as well as giving a little information about the flag itself, relevant lessons are also brought from God's Word. Pamela is currently working on a few more titles. Pray that God will bless this new area of ministry in the days to come and that unsaved and saved children alike will be spoken to through the written message. August/September 2010 - During this trip we were very privileged to have many opportunities to share the Gospel with many boys and girls. The main lesson taught was that of Madugu, a little african boy who trusted the Lord as Saviour and then went and told others. A great challenge for the saved child as well as clearly presenting the Gospel. We visited numerous schools, Sunday Schools and Churches. On one occasion, in a remote area of Western province, there were so many people gathered in that the people had to be divided and the meeting held in two sittings! March 2008 - During this visit Pamela didn't directly teach the children; but took the opportunity to simply spend time with some little ones. Times like this are very important and help to build up trust and confidence, especially when the visitor looks and speaks so differently. Hopefully the friendships made will help make all more comfortable when it comes to sharing the Gospel and evangelising. In one particular village; during previous visits; the children were sometimes shy and curious around Pamela. It was encouraging to see them so much more relaxed and confident during this trip. On one occasion, as they trailed around an old rope, Pamela began a game of skipping. All, including Pamela, enjoyed participating and it was lovely to see the children enjoy themselves and continue to have fun even as Pamela was leaving. July 2007 - Pamela was encouraged by her visit to one particular church in Nairobi. She was given opportunity to teach the children for a period of about 2 hours. There was lots of singing, a memory verse, Bible Lesson and Pamela also shared her testimony. The testimony was shared in story form about a little girl in the UK who was saved and eventually called to Kenya. The children listened carefully and were amazed to discover that the little girl was Pamela!! Pamela also taught them a CEF lesson about a little boy from Niger who was given a wordless book and became a little missionary himself by using the book to share the Gospel with his friends. Pamela gave each child a wordless book of their own and encouraged them to use it. What a joy to later speak to a mother who was able to tell us the Gospel story....why?...because her 6 year old son had used his wordless book to teach his mummy! "A little child will lead them!" 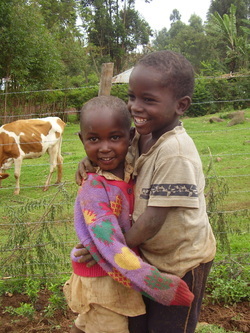 December 2006 - It was a joy for Pamela to teach children in the Kisii area of Kenya. In 2 particular churches the children listened intently to the lesson of the paralysed man. July 2006 - A missions day was held in a church in Nairobi. Pamela, as well as teaching a Bible Lesson, also taught the children about her home country of Ireland.